To view Part 1 click here. It finally feels like I'm getting somewhere, once the paint starts going on. It provides a temporary welcome relief from the construction, which we'll have to get back to in short order. When we were up at last year's Small Reach Regatta we had a look at Mark Ober's striking Pulsfer Hampton. His cockpit sole was painted a beautiful sand color, and I asked him if it was from Petit paint, and he said he thought it was. I looked at the Petit Easypoxy color chart, and spotted it immediately. Sandtone. I was able to pick all of my colors from the Petit catalog, happily, and ordered the lot from Jamestown Distributors. Easypoxy is a single part polyurethane, similar to Interlux Brightsides, which I've used a lot. Some people advocate painting directly over cured and sanded epoxy with polyurethane paints, but I have always used an appropriate primer which fills small blemishes, and sands beautifully. That is what I did here. Areas to be later bonded to with epoxy are taped off before painting. I enjoy painting, but it is a lot of work, and somewhat of a marathon. 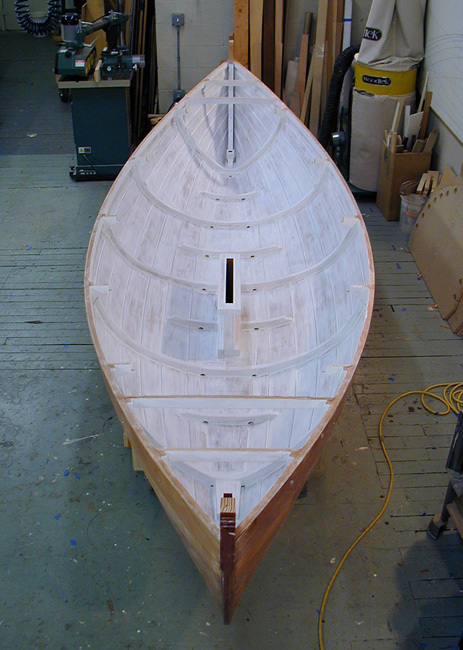 I started on the primer coat one evening about 6:00, and didn't leave the shop until 2:00 am! I was happy the next day that it sanded easily. I then put on three topcoats of Sandtone, sanding in between. The first coat I left gloss, but added a little flattener to the last two coats. Its helps to soften the effect a little, but is not quite as durable as the super high gloss. I did say that I enjoy painting a boat, but the enjoyment is tempered somewhat after going around the boat four times with paint and sandpaper. I can't imagine how someone could get on six or seven coats, though it does get easier as you build up the surface. I keep my boats well covered and protected from the sun, and after four years my crab skiff Cricket still looks great. I've been hanging on to some salvaged redwood boards for quite a while, thinking I could use them in a boat somewhere, and decided the MDE floor boards would be the perfect use for them. I had a few pieces of dressed 5/4 stock, with a few nail holes from some previous, unknown application (I can't even remember where I got them), and I found an old picnic table top in the dumpster down by my loading dock. 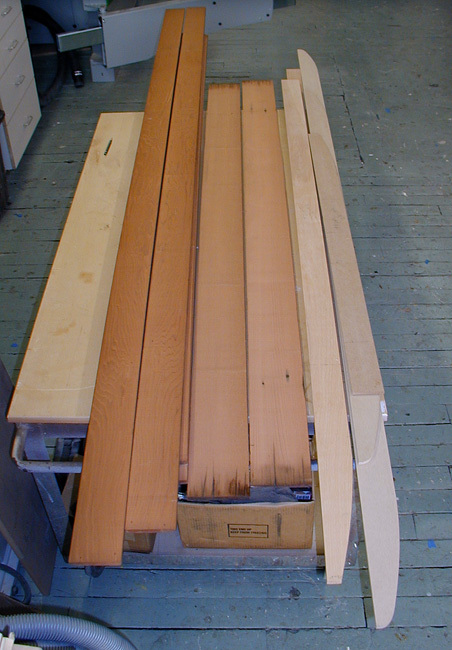 I also salvaged a dozen old growth fir 2x4's, vertical grain and virtually clear, from the same dumpster. 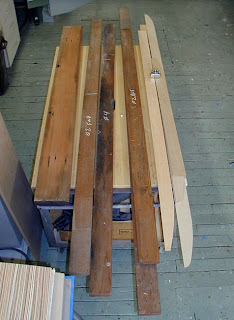 I've set those aside for a later project, like frames for a dory maybe. 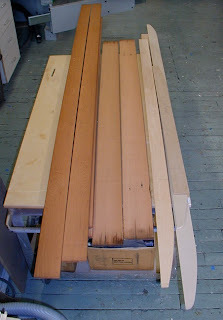 I pulled out the floorboard patterns that I had previously made, and laid out the lengths on my redwood stock. I resawed the boards on the bandsaw, then dressed them down to about 7/16". I was concerned that they would be strong enough, but the spans are not over 15", so I think they will be adequate. ...and split open on the bandsaw. I whittled out about 50 little plugs from the redwood rips, and drove them into any old nail holes that remained after cutting the floorboards out. I love the feel of oiled floorboards under my bare feet. Cricket has a cedar sole that is comfortable, and that I renew with oil every season. I used the old pinetar-linseed oil-turps concoction on Cricket, but I didn't have any on hand in the shop. 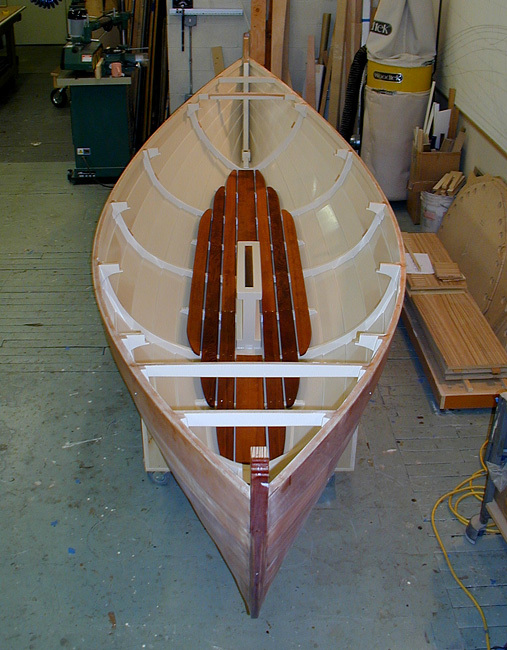 I did have a bottle of so-called "teak oil", which I put on the redwood, and it is beautiful. 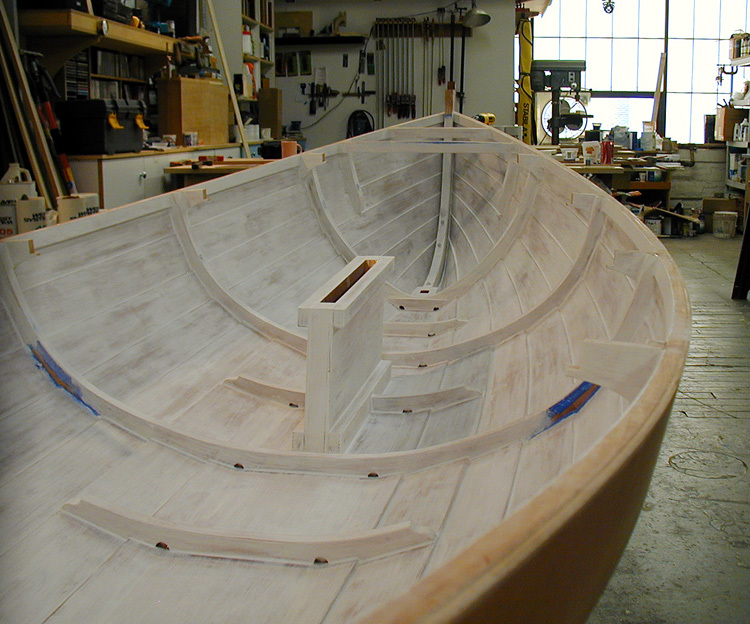 The old wood has a lot of character, and looks great in the boat. 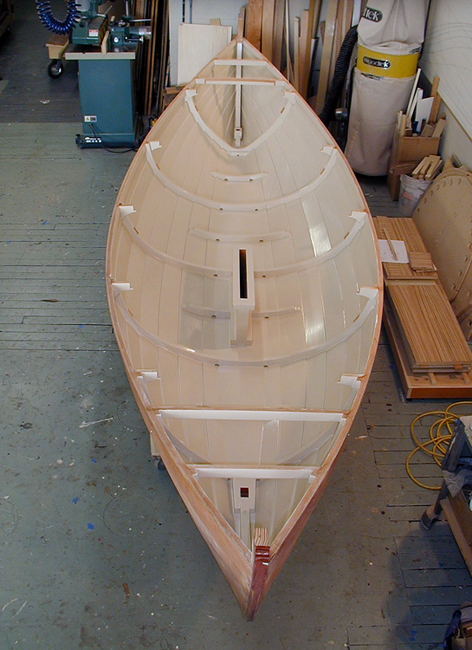 The oiled redwood looks pretty against the painted hull. 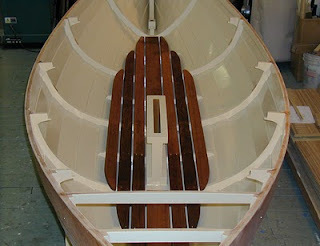 great blog - looks like the boat is coming together nicely. 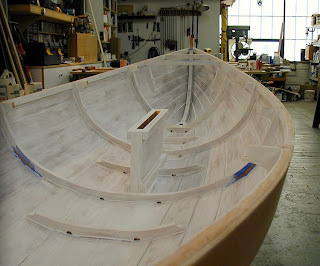 I was wondering if using the particle board for the moulds caused any problems or challenges - like bevelling the edges. I'm new to this but alot of the books seem to recommend pine.